Tax liens and tax deeds are enigmas that have given rise to more questions than answers for the majority of today’s real estate investors. As a result, it’s not uncommon for investors to overlook their potential, and completely ignore what has developed into a lucrative niche for many. 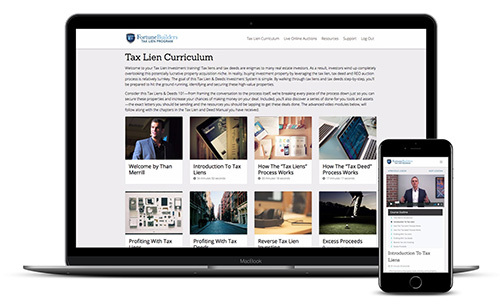 Upon completion, you’ll have all the tools you need to hit the ground running, identifying and securing properties in the tax lien and deed investment landscape. Consider this particular training system your introduction Tax Liens & Deeds. From framing the conversation to the process itself, we’re breaking every step of the system down so you can simultaneously secure said properties and increase your chances of making money on a deal. We have also included a series of done-for-you tools and assets—the exact letters you should be sending and the resources you should be tapping into in order to see a deal through to completion.